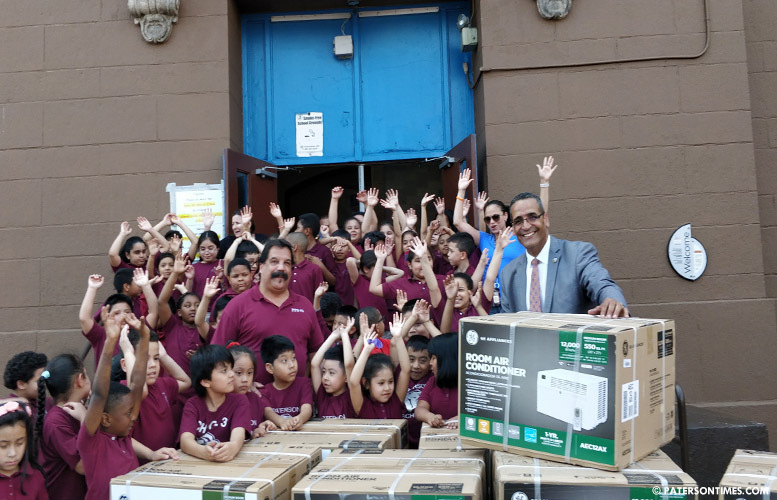 The students and teachers of School 3 received 15 air conditioners to cool their classrooms inside a more than 100-year old building on Main Street. Councilman Luis Velez arranged the donation of the window air conditioning units on Thursday afternoon through prominent real estate developer Charles Florio. “It’s a lot of help. My daughter is always complaining about the heat during the summer time,” said Melady Diaz, who came to pick up her two daughters from the neighborhood school that educates 428 students in K-8 grades. 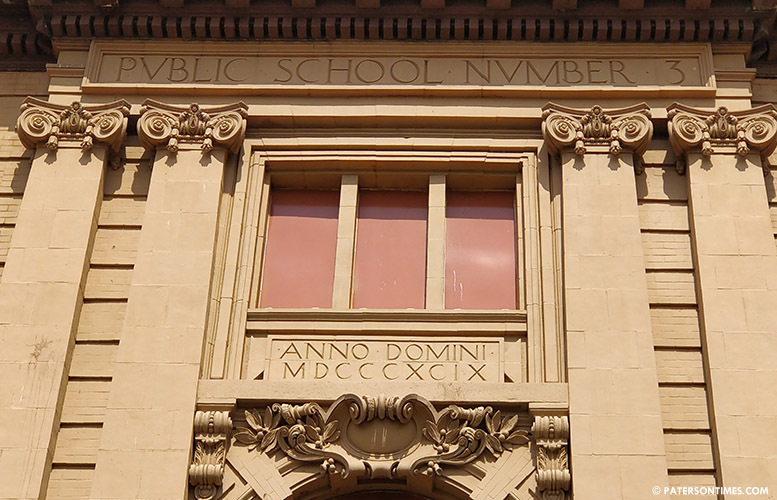 Several teachers at the school said it is extremely difficult to teach students when the temperature soars to 90 degrees Fahrenheit inside the school building. Getting students to concentrate on lessons is impossible, they said. Rodriguez shared his struggle to get air conditioning in all his classrooms with Velez. “He told me he could help,” said Rodriguez of Velez. Velez represents the 5th Ward where the school is located. He approached Florio for assistance. “We got students sweating in classrooms,” said Velez. He said the school’s Parent-Teacher Organization (PTO) tried to raise money, but very little was raised. Velez knew one of the teachers. He conversed with her in Spanish. The air units are GE 12,000 BTU Smart Room Air Conditioner with WiFi and Remote designed to cool a 550 square feet space. Rodriguez said the school’s specialty classrooms like computer and science labs already have air conditioning units. Each unit will be installed in a classroom, said Rodriguez. After the 15 units are installed, a handful of classrooms will still remain without air conditioning, he said. “We’re going to be trying to get this done as quickly as possible,” said Rodriguez. He said the school’s age does not allow for central air conditioning. The school was built in 1899. He will have to wait two weeks before the units can be installed. A resolution has to be passed by the school board for the school to accept the donation. Superintendent Eileen Shafer said it will take two weeks for the resolution to be presented to the board because the Board of Education just had a meeting yesterday. The next meeting isn’t until May 16, 2018. Florio said the cost for the units purchased at the Home Depot in Paterson was $4,800. While speaking of the air conditioning units, Florio recalled reading a story in the newspaper that stated police were complaining about lack of air conditioning inside the Frank X. Graves Public Safety Complex. “I was laughing at that, reading. So, kids can be in 90, 100 degrees, but the cops can’t man up?” remarked Florio. Florio did not spare anybody. He said politicians are raising hundreds of thousands of dollars some of which ought to be given to the community rather than expended on signs and mailers that will become garbage after next week’s election. He also took aim at business owners for failing to serve the community. “Step up to the plate, help the community out. It doesn’t have to be thousands of dollars. Private business really needs to step up and help Paterson,” said Florio. He said too many business owners, who have operated shops for decades, complain about business being bad in the city. “If Paterson is so bad, get out of Paterson,” he said. Florio has over 1,000 apartments in the Silk City. His investment is mostly in the 1st, 4th, and 5th Wards.